Make Menus, Shopping Lists & More! 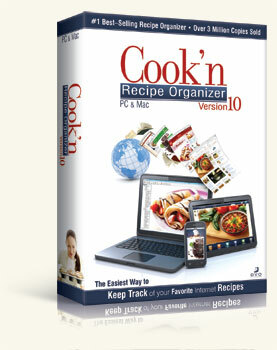 "I just set up my new Cook'n Recipe Organizer on my PC. I used my older version all the time and I am sure that I will enjoy this one even more. Thank you for providing such an awesome recipe organizer. Your products are wonderful and I so enjoy visiting with you and Kathy once a month in my news letters. I highly recommend your products to any and every cook. I have had nothing but 200% service in all of the years that I have done business with you." Great product and superior service!